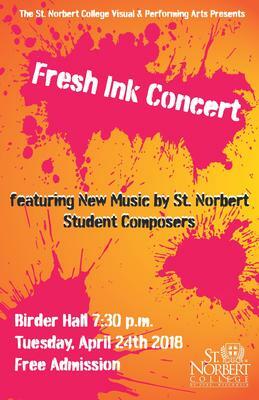 The Fresh Ink Concert features original works by St. Norbert student composers. The student composers receive instruction from Dr. John Hennecken who also serves as the concert's director. The concert is performed at Dudley Birder Hall. St. Norbert College Music Department, "Fresh Ink Concert" (2018). Music Performances. 51.